Cpl. Kelsey De Santis poses with Justin Timberlake at her unit's Marine Corps Birthday Ball on Saturday night. 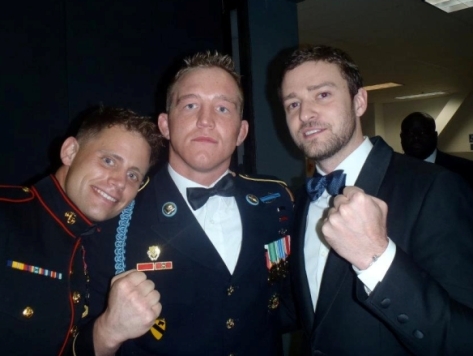 Justin Timberlake’s thoughtful reflection on attending the Marine Corps Birthday Ball in Richmond, Va., on Saturday night blew up the blogosphere. Cpl. Kelsey De Santis is taking the opportunity to weigh in, too, however — and it sounds like she had a great time. In a new blog post on her website, De Santis said she had the chance to visit with Timberlake before the event, and was impressed with his willingness to mix it up with everyone else at the ball. As the official ceremonies ended, Table 10 got the party started, shared some jokes, gathered for a group dance floor session, and enjoyed the night to the fullest. There was never a dull moment! And I have to say Justin fit right in. As the night came to a close, we all walked out with Justin and said our goodbyes… but he didn’t get to leave the Ball without first receiving a bayonet engraved with ‘Justin “come tussle” Timberlake’. Man Cpl. Kelsey De Santis really has a massive ribbon/medal stack. Four years and no deployments? Good report. Thanks for getting the photo of the 1CD soldier in there, too. Thanks for sharing her blog. It confirms what I already knew: fleet dodging boot. How in the world does someone go through eight years in the Marines as we’re fighting two wars only to never leave CONUS and not even bother to get her medals professionally mounted for the ball? Even if I’m wrong and she simply got an extension on her original contract, that is still pretty heinous. Four years and never left CONUS. Pathetic.